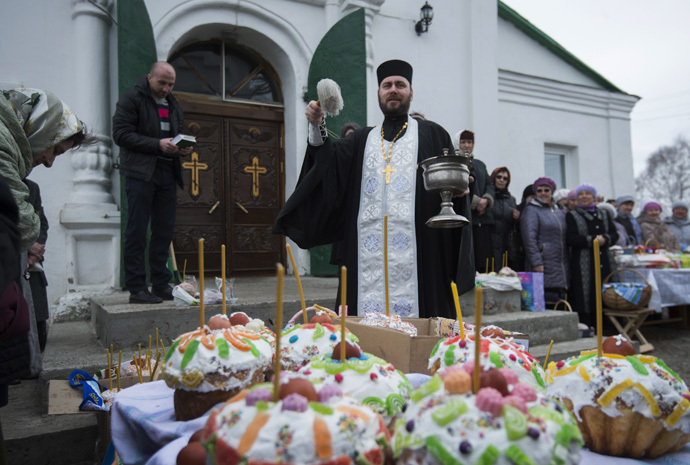 Orthodox Christians are celebrating Easter, marking the resurrection of Jesus Christ. It started with the centuries old tradition of lighting the Holy Fire in Jerusalem, before the flame was transported around the globe. 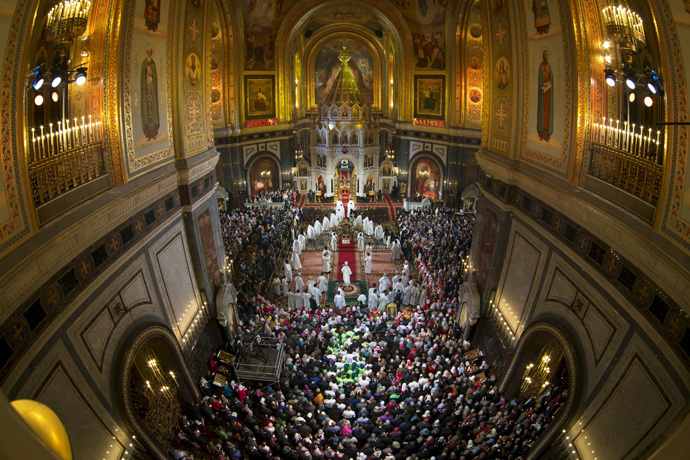 The main Orthodox Easter celebration in Russia took place at the Cathedral of Christ the Savior on Sunday. Russian President Vladimir Putin attended the religious ceremony along with another 5,000 worshipers. The head of the Russian Orthodox Church, Patriarch Kirill, led the service. 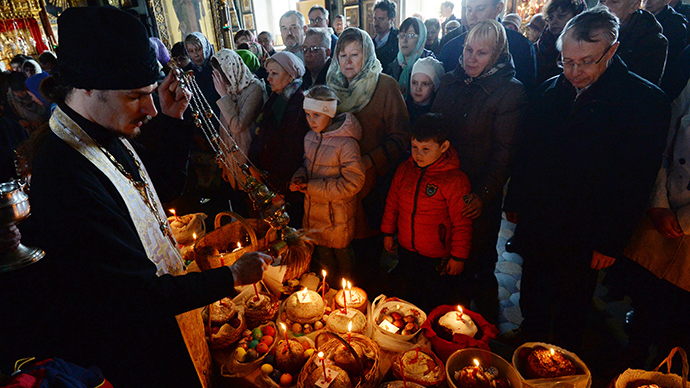 On Sunday Patriarch Kirill delivered his traditional Easter address to Orthodox believers. In the speech he noted that this year Russia will mark the 70th anniversary of the Victory in the WWII. “When spiritual heroism becomes the substance not only of the individual but of an entire people, when in striving for the celestial world the hearts of millions of people are united, ready to defend their homeland and vindicate lofty ideals and values, then truly amazing, wondrous things happen that at times cannot be explained from the perspective of formal logic,” he said. “The nation acquires enormous spiritual strength which no disasters or enemies are capable of overcoming. The truth of these words is evidently shown by the Victory in the Great Patriotic War, achieved by the self-sacrificing heroism of our people,” the Patriarch added. Shortly before the service, Patriarch Kirill received the Holy Fire that was delivered directly from the Church of the Holy Sepulcher in Jerusalem. Christians celebrate Easter, which is their most important religious annual celebration, on the third day after the crucifixion of Jesus Christ. The holiday does not have a fixed date in relation to the civil calendar and is celebrated on the first Sunday after the full moon following the March equinox. On Sunday thousands of worshippers flocked to Jerusalem to take part in the annual ceremony during which a flame is believed to miraculously emanate from within Jesus Christ's tomb on Holy Saturday. After candles of the clergy and pilgrims in attendance were lit from this flame, it travelled to Orthodox Christian nations around the globe. Specially charted planes were used to transport the flame to countries like Russia and Greece. This year, the holy flame was delivered to Serbia for the first time. Thousands of people, including Serbian President Tomislav Nikolic, welcomed its arrival during a service at the Church of Saint Sava in Belgrade. This year, Orthodox Easter fell on the same day as Cosmonautics Day– April 12. On Sunday, Patriarch Kirill spoke with Russian members of the International Space Station, to congratulate them with their holiday, as well as wishing them a happy Easter. Catholics and Protestants both celebrated Easter on April 5. Meanwhile, Jews worldwide are celebrating the festival of Passover, or Pesach, which commemorates their liberation from slavery in Egypt. It began on Friday and will last for a week.